Today Antutu reveals our list of the global top 10 best performing Android phones for November 2018. What are the best Android phones on the market right now? Check out our most updated November ranking as measured by the average Antutu score. 2. Period of data collection: November 1, 2018 to November 30, 2018. 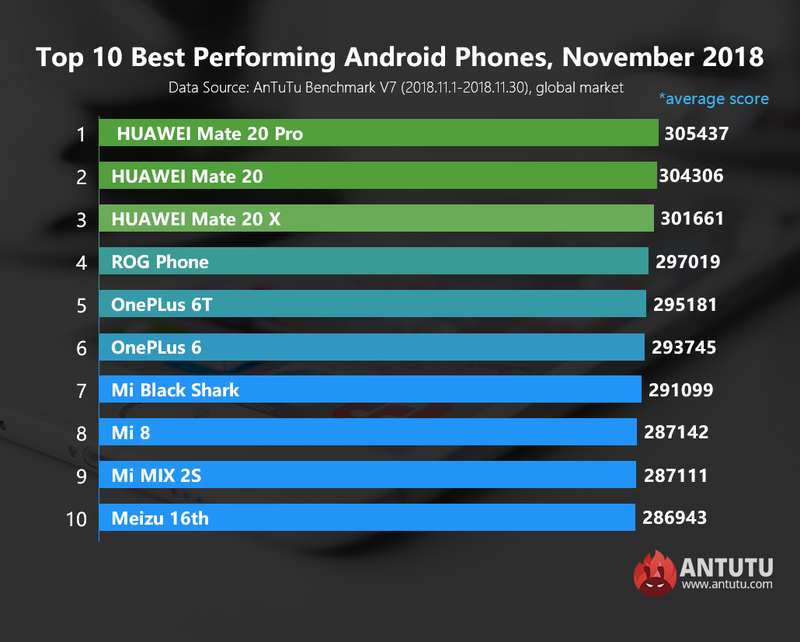 In November, HUAWEI Mate 20 Pro powered by Kirin 980 processor topped the list once again with an average Antutu score of 305,437 points, followed closely by HUAWEI Mate 20 (No.2) and HUAWEI Mate 20 X (No.3) with an average Antutu score of 304,306 points and 301,661 points respectively. Before the release of devices powered by Snapdragon 855 and Exynos 9820, the HUAWEI Mate 20 siblings are expected to remain on the top three positions over the next few months. Rounding out the top 10 are ROG Phone (No.4, 297,019), OnePLus 6T (No.5, 295,181), OnePlus 6 (No.6, 293,745), Xiaomi Mi Black Shark (No.7, 291,099), Xiaomi Mi 8（No.8, 287,142）, Xiaomi Mi MIX 2S (No.9, 297,111) and Meizu 16th (No.10, 286,943). All these smartphones are powered by Snapdragon 845 and have flagship-level hardware configurations. In particular, the fourth-ranked ROG Phone is powered by a speed-binned Snapdragon 845, allowing it to deliver better performance than smartphones powered by the standard Snapdragon 845. The performance of the rest of the Snapdragon 845 devices differs slightly due to different driver versions and cooling systems. Now that Exynos 9820 and Snapdragon 855 have already been officially launched, let’s see when devices powered these two processors will enter Antutu’s top 10 list. The above data reflects the changes of Android phone performance for November, 2018. For more information about the ranking list, please visit Antutu official website or download AnTuTu Benchmark and check in the menu of “Ranking”.